Kontos Foods | Favorite Foods, Inc. Whether you’re preparing dinner for your family, lunch for a hundred restaurant patrons, or those special desserts for the pastry counter in your market, Kontos has the finest products for your culinary needs. For more than 60 years we have produced premium-quality products using the finest ingredients and time-honored methods. The Kontos name will always be your guarantee of quality, flavor, and convenience. It’s our traditional hand-stretching method that makes all the difference. Our flatbread bakes to a golden brown on the outside, but stays light and flavorful on the inside. We offer more than 50 varieties of flatbreads, including Pocket-Less Pita®, traditional Pita of the Eastern Mediterranean, Asian Nan, Pan Plano infused with the spicy flavors of Mexico, “better-for-you” Greek Lifestyle, Rustics Collection Naan, and Panini, which can come with grill marks for more appealing sandwiches. We also offer mini Cocktail Flatbread, which is ideal for hors d’oeuvres and snacking. 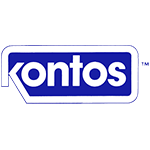 Kontos supplies only premium grade USDA-approved Gyro and meat products. Cones, loaves or slices of Gyro Meats, Souvlaki on skewers, and food service trays of Pastichio and Moussaka are prepared and packaged for maximum efficiency in any foodservice operation. In 1949, Evris Kontos brought his experience as a phyllo mastoras (master fillo maker) from Cyprus to the United States. He developed the first machine to produce ultra thin Fillo, allowing this light, flaky pastry to be available in your local market. From our tissue thin #4 Fillo to our thickest and strongest yet, #10 Country-Style Fillo, our range of thicknesses adds a new dimension to your culinary creativity and the finishing touch to your sweet desserts, savory appetizers, and entrees. Try our Kataifi to add beautiful birds’ nests and delicate pastry decoration to your creations. We offer a variety of prepared products—made with Kontos Fillo Dough—for your convenience. Kontos Fillo Products and Pastries are available in retail packaging and foodservice trays for commercial use. Spanakopita and Tyropita are available frozen, in bite-size portions (retail and foodservice) and in various larger sizes up to a 6-ounce Fillo-topped entrée size (foodservice only). Freshly-baked pastries are available for both retail and foodservice in a mouth-watering array of flavors and textures, including Baklava, Kataifi Pastry, Loukoumades, and other specialties. Kontos distributes the very best selection of traditional Eastern Mediterranean specialty products. Some of these specialties are made by Kontos, and we seek out premier importers from this region to supplement our own product offerings. Dolmades, Tarama and Taramosalata, Hummus, Falafel, Special Relishes, Oils, and many other regional products are in our inventory. Kontos is your trusted source for cheeses and olives from Greece and other Mediterranean countries and from fine domestic US producers, as well. Kalamata and Gaeta Olives, Giardiniera and Pepperocini, the finest cheeses including Feta, Kefalogravera, Manouri and Halloumi, and Pressed Greek Yogurt put Kontos at the top of the list of suppliers of these sought-after ethnic products.